RapidMiner Radoop functions are installed automatically in the Hive database configured in the Radoop connection. The following manual installation steps are only required if Radoop (more precisely, the Hadoop user configured in the Radoop connection) is not allowed to create functions from jar files uploaded to the HDFS. distribute and install the jar files manually. The following two step-by-step guides describes these two options. RapidMiner Radoop UDFs are also available in Cloudera parcel format. The parcel can be obtained from the following URLs. Please note that you have to choose the URL based on RapidMiner Studio / Server version and not Radoop extension version. Depending on your configuration you may have multiple versions of the parcel listed with different statuses. If the activate dialog does not display service restart options, you have restart Yarn and Hive services manually. RapidMiner Radoop automatically uploads two files (radoop_hive-vX.jar and rapidminer_libs-<version>.jar) to the HDFS and uses them to define custom Hive functions (UDFs). 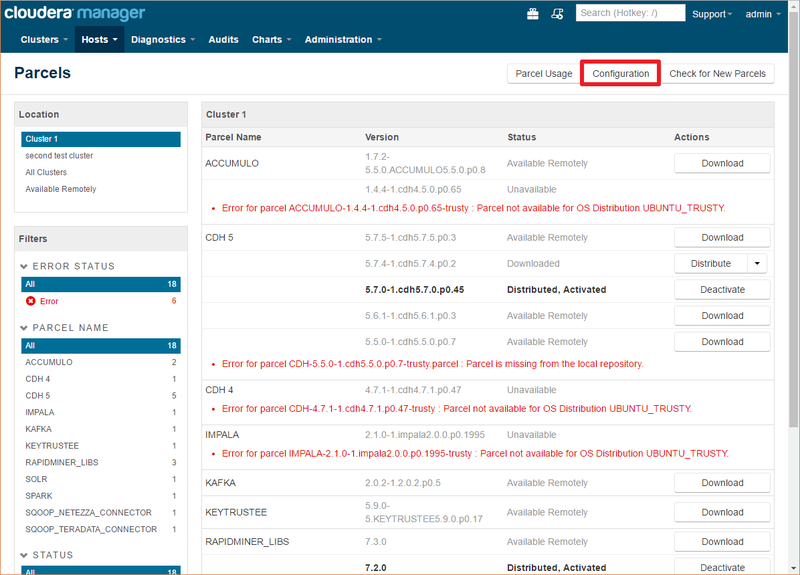 For secure Hadoop clusters, this is usually prohibited so the Hadoop administrator needs to install these UDFs manually. Even in case of a Hadoop cluster without security, you may decide to install these UDFs manually for performance reasons so they does not get distributed for each and every job. Note that a RapidMiner Radoop upgrade in this case may also require manual steps. Download the two RapidMiner Radoop UDF JAR files. Please note that you have to choose the URL based on RapidMiner Studio / Server version and not Radoop extension version. Copy the downloaded JAR files to the local filesystem of every node. The path to the JAR files must be the same on each node. For example, /usr/local/lib/radoop/radoop_hive-v4.jar and /usr/local/lib/radoop/rapidminer_libs-9.1.0.jar. Add the JAR files to the Hive classpath by copying or linking them into the $HIVE_HOME/lib/ folder. You need to do this only on the node that hosts the HiveServer2 service. Do not change the JAR file names. Add the JAR files to the MapReduce application classpath by editing the mapreduce.application.classpath property in the mapred-site.xml or do the same in Ambari or Cloudera Manager. For example, add /usr/local/lib/radoop/radoop_hive-v4.jar:/usr/local/lib/radoop/rapidminer_libs-9.1.0.jar to the existing value, separated by the : character. When using Hive on Tez, the tez.cluster.additional.classpath.prefix property (of tez-site.xml) should be changed instead of mapreduce.application.classpath. Please note that these properties may be empty for some distributions. After this change, a YARN restart may be necessary. When upgrading the cluster, the steps above may need to be performed again as for example Ambari deletes and recreates the $HIVE_HOME/lib/ folder. If the jar files are not present on every node, exceptions like org.apache.hive.com.esotericsoftware.kryo.KryoException: Unable to find class: eu.radoop.datahandler.hive.udf.GenericUDTFApplyModel may be thrown. As an admin user (or a user that has CREATE FUNCTION privileges), connect to HiveServer2 (e.g. using Beeline), and create the permanent functions in all databases that RapidMiner Radoop users will connect to using the commands below. Please change the database name in the first line of the script, and execute the script for all relevant databases. You also have the opportunity of defining a database dedicated for Radoop UDFs, which should be used (and therefore accessible) by all Radoop users. The functions should be then created only for a single database. For your Radoop connection check the UDFs are installed manually box on the Connection Settings dialog. As an advanced analytics solution, RapidMiner Radoop is able to push very complex processes to Hadoop. It creates temporary objects (tables, views, directories, files) in Hadoop during process validation, process execution, during data import or full connection test. These objects are deleted automatically as soon as they are not needed anymore. Namely, once a process or an import job or a full connection test completes or fails, all related objects are deleted. For processes, this default behavior may be altered: if the cleaning parameter of the Radoop Nest operator is unchecked, then these objects will not be removed after a process completes. The only reason why you may want to disable the cleaning is debugging. During normal operation, it should always be enabled, since temporary objects may consume an increasing amount of space on the HDFS. the connection is lost before the process or the cleaning phase completes. In these cases, temporary objects will still be automatically removed by the periodic cleaning service. When running RapidMiner Studio with RapidMiner Radoop, the software periodically checks for potentially remaining temporary objects that are older than 5 days (by default), and removes the objects it finds. The interval for this service can be modified by specifying an interval in days in the Settings / Preferences / Radoop / Automatic cleaning interval setting. The temporary objects can also be explicitly removed on the Hadoop Data view. Right click on a connection, and choose the menu item Clean Temporary Data. The pop-up dialog will ask how many days it should look back, meaning that it will consider objects older than this interval. You may select 0, which will delete all temporary objects for your user. Please note that if you have processes currently running on this cluster, then removing all temporary objects may break their run. The pop-up dialog will immediately report the number of objects that you are about to delete. Temporary objects can also be manually removed by a user with appropriate privileges, e.g. an administrator. This way, you may also delete other user's temporary objects which may break their process runs, so only use do this, if you are confident that it is safe to delete the objects you select. Temporary tables and views can be easily distinguished from normal tables and views, because they use a common prefix: radoop_ by default. They also contain the name of the user that creates the object (consisting only of lowercase alphanumerical characters and the underscore character). This prefix can be changed. Use the Settings / Preferences / Radoop / Table prefix setting or the table prefix parameter of the Radoop Nest operator to change the default prefix of these temporary objects. On the Hadoop Data view you can easily filter for this prefix, select all your remaining temporary objects and delete them. The object names also contain a timestamp, so an ascending ordering shows the oldest objects on top. Temporary files and directories on the HDFS do not show up in the object list, so they are not visible in RapidMiner Studio. 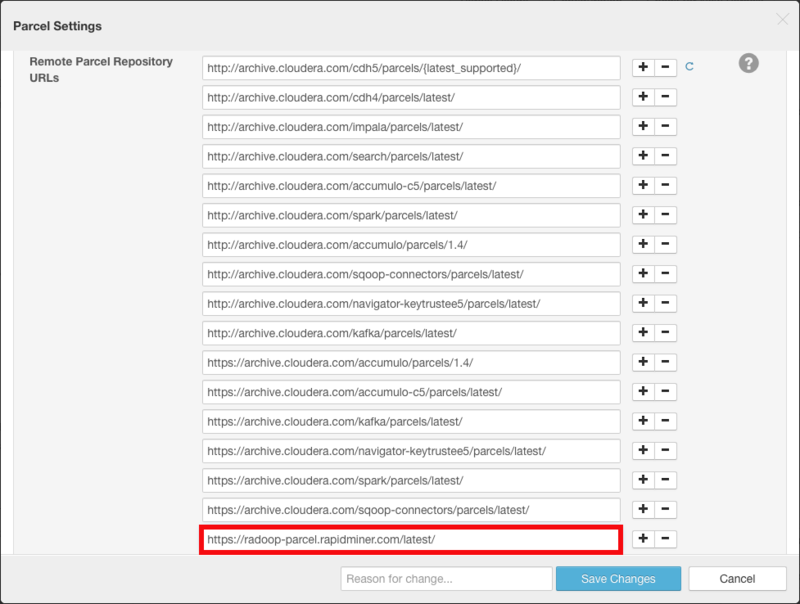 It is unlikely that remaining temporary files may consume significant space on the HDFS, nevertheless, a Hadoop administrator can easily remove them from the directory hdfs:///tmp/radoop/<username>/. All temporary directory names start with the prefix tmp_. The following command removes all temporary files of a particular user (replace <username> in the command).